A Warehouse Management System, or WMS, is a key part of the supply chain and primarily aims to control the movement and storage of materials within a store or a big warehouse and process the associated transactions, including shipping, receiving and picking. The systems also direct and optimize stock put-away based on real-time information about the status of bin utilization. Warehouse management systems often utilize barcode system to ensure efficiency in monitor the flow of products. Once the data has been collected, there is either a batch synchronization with, or a real-time wireless transmission to the database. The database can then provide useful reports about the status of goods in the warehouse. The objective of a warehouse management system is to provide a computerized procedures of handling the receipt of stock and returns into a warehouse facility, model and manage the logical representation of the physical storage facilities (e.g. racking etc. ), manage the stock within the facility and enable a seamless link to order processing and logistics management in order to pick, pack and ship product out of the facility. Warehouse management systems can be stand alone systems or modules of an ERP system or supply chain execution suite. The primary purpose of a WMS is to control the movement and storage of materials within a warehouse – you might even describe it as the legs at the end-of-the line which automates the store, traffic and shipping management. In its simplest form, the WMS can data track products during the production process and act as an interpreter and message buffer between existing ERP and WMS systems. Warehouse Management is not just managing within the boundaries of a warehouse today, it is much wider and goes beyond the physical boundaries. Inventory management, inventory planning, cost management, IT applications & communication technology to be used are all related to warehouse management. The container storage, loading and unloading are also covered by warehouse management today. Warehouse management today is part of SCM and demand management. Even production management is to a great extent dependent on warehouse management. Efficient warehouse management gives a cutting edge to a retail chain distribution company. Warehouse management does not just start with receipt of material but it actually starts with actual initial planning when container design is made for a product. Warehouse design and process design within the warehouse. Warehouse management monitors the progress of products through the warehouse. It involves the physical warehouse infrastructure, tracking systems, and communication between product stations. Warehouse management deals with receipt, storage and movement of goods, normally finished goods, to intermediate storage locations or to final customer. In the multi-echelon model for distribution, there are levels of warehouses, starting with the Central Warehouse(s), regional warehouses serviced by the central warehouses and retail warehouses serviced by the regional warehouses and so on. The objective of warehouse management is to help in optimal cost of timely order fulfillment by managing the resources economically. Warehouse management = “Management of storage of products and services rendered on the products within the four walls of a warehouse”. The eStockCard Inventory software has been designed to meet most of the function in a WMS System. Download the Free Inventory Software today! Warehouse management systems (WMS) are best described as the advanced technology and operating processes that optimize all warehousing functions. These functions typically begin with receipts from suppliers and end with shipments to customers, and include all inventory movements and information flows in between. Warehouse management systems have typically been associated with larger, more complex distribution operations. Small, non-complex distribution facilities have historically not been viewed as candidates to significantly streamline operations and reduce costs. However, even smaller and midsize companies are increasingly recognizing the significance of warehouse management systems in today’s environment of integrated logistics, just-in-time delivery, and e-commerce fulfillment. In practice, successful WMS solutions are generally designed to merge computer hardware, software, and peripheral equipment with improved operating practices for managing inventory, space, labor, and capital equipment in warehouses and distribution centers. Implementation of a WMS allows a company to increase its competitive advantage by reducing labor costs, improving customer service, increasing inventory accuracy, and improving flexibility and responsiveness. A WMS enables a company to manage inventory in real time, with information as current as the most recent order, shipment, or receipt and any movement in between. * Faster inventory turns. A WMS can reduce lead times by limiting inventory movement and improving the accuracy of inventory records, thereby supporting a JIT environment. As a result, the need for safety stock is reduced, which increases inventory turnover and working capital utilization. * More efficient use of available warehouse space. In addition to reducing safety-stock requirements, a WMS can often increase available warehouse space by more efficiently locating items in relation to receiving, assembly, packing, and shipping points. This increased efficiency can both improve productivity and lower inventory holding costs significantly. * Reduction in inventory paperwork. Implementation of a real time WMS can significantly reduce the paperwork traditionally associated with warehouse operations, as well as ensure timely and accurate flow of inventory and information. Receiving reports, pick tickets, move tickets, packing lists, etc., which are typically maintained as hard copies, can all be maintained electronically. * Improved cycle counting. Companies can use WMS to capture relevant data (e.g., frequency of movement, specific locations, etc.) to systematically schedule personnel for cycle counts. Such cycle counts not only can improve the accuracy of inventory records for planning purposes, but also can eliminate or reduce the need for complete, costly physical inventories. * Reduced dependency on warehouse personnel. Implementing a comprehensive WMS facilitates standardization of inventory movements, picking methods, and inventory locations. This standardization helps to minimize reliance on informal practices, resulting in reduced training costs and lower error rates. * Enhanced customer service. By streamlining processes from order to delivery, companies can more accurately determine product availability and realistic delivery dates. A WMS can automatically identify and release back-ordered inventory and also can reduce returns as a result of increased shipment accuracy. * Improved labor productivity. A WMS helps optimize material flow, typically by incorporating several inventory picks into one or by “cross docking”. Cross docking is a process that routes incoming shipments to the location closest to the outbound shipping dock, thereby reducing warehouse handling. * Goods shipped by the warehouse over any given period of time. The warehouse management can determine how much inventory exists in the various stages of processing unlike in non-automated warehouse management. Sales people can determine how much inventory is available and can relate better to the warehouse staff thus bettering their Customer Relationship levels. Customer Managers can reserve inventory for a customer thereby ensuring that it will not be shipped to anyone else. Inventory Managers can track transactions at a very fine detail to diagnose unexpected sudden changes in inventory. For example, if we had thousands of pieces of some SKU yesterday and today we don’t have any, then where did they go? Were they shipped to some other customer? Were they sent to some other warehouse of the company to be shipped from there? Or did they get lost or were picked away? WMS helps answering such problems. The reports generated during checking processes enable policy decision to be taken about the reliability of the suppliers. WMS is designed to be flexible i.e., the process flow of the DC/Warehouse can now be modified easily as business needs change. For Warehouse Supervisors: Productivity reports for each operator can now be generated and used to implement productivity based remuneration schemes or to fire unproductive employees. For those warehouses that have to cope up with Union problems these reports can help the company tremendously. Efficient tracking of warehouses activities are possible with WMS as it provides a comprehensive set of web-enabled reports detailing all the activities happening in the warehouse and their effect on the inventory management. WMS also helps to detect bottlenecks in operations, which can increase the overall throughput of the warehouse. For Warehouse Operators: WMS provides graphical user interfaces (GUIs) wherein most of the time the operator has to just scans the barcodes. Default navigation of cursor on the screen mimics the standard business rule. Thus WMS eases the operator’s task and makes the data input process fast, increasing the overall efficiency of the operator. Some programs like Locating and Pulling are especially designed to run on hand-held radio frequency terminals. These terminals make the task of pickers and locators easy, as these are easy to carry. Modern WMS programs have been coded with extra emphasis on scanner based data input to minimize the need for keyboard or mouse input. In every organization, a warehouse is an important asset for the stock inventory storing. Therefore a good warehouse practices is necessary and important to be followed everyday in the daily operation. Keep dock doors closed and latched when not in use. Keep off perimeter, including trashcans. Never set food cases on the floor. Record inbound product temperatures and reefer setting. Remember the “Danger Zone” for “high-risk” foods. No food, drink, gum, or tobacco products in the Warehouse. Report all spills or damaged traps or cases immediately. No personal food in our coolers/freezer. No food in trash cans. Debris only. Inspect empty pallets for rodent or insect activity or odors. Sweep out and inspect trailers before loading. Fill out “Trailer Inspection Program” form completely. Take meals in break room, lunchroom, or outside the building. Never sit or walk on freight. Keep dumpster lids closed when not loading. No food or drink in lockers. Use a Slip Sheet on damages and returns. Fill out “Incoming damages and Overages” report. Keep cooler/freezer doors closed at all times. Traps should be flush against the wall. Report any rodent, bird, or insect activity to a Supervisor or member of the Food Safety Team. Fill out Trailer Inspection Sheet on Outgoing Loads. Keep 14” between every two rows for inspection and cleaning. Report damaged racks, guardrails, and cooler doors. Adequate free air circulation all around the load is essential during refrigerated/frozen transportation. Personal items and effects are to be kept in designated areas. Inspect all incoming freight for spillage, especially bagged product. Where seals are present on incoming loads, the seal number should be checked against the seal number on the bill of lading to ensure that the two match. No glass containers inside the warehouse. Most of us know what it is. Some of us recognize the benefits of it. Few of us have made it be part of standard operating procedures in their organization. 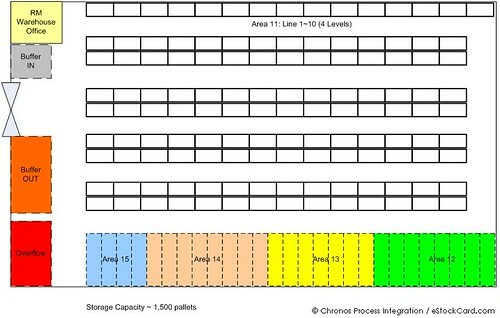 Cycle counting will increase the accuracy of inventory data in your systems. By examining inventory daily, you’ll find those mystery items that have found their way to the shelves. You can correct items that have been put in the wrong place. You can rotate stock according to their expiry date. The list can go on indefinitely. Cycle counting is penicillin for many organization ranging from manufacturer to distributors because it attacks so many little problems and solves them on a timely basis. The warehouse operations for the stock inventory need to be monitored from time to time to find out whether the organization is wasting money in storing products and materials. Evaluate how well you are using the storage space you have. 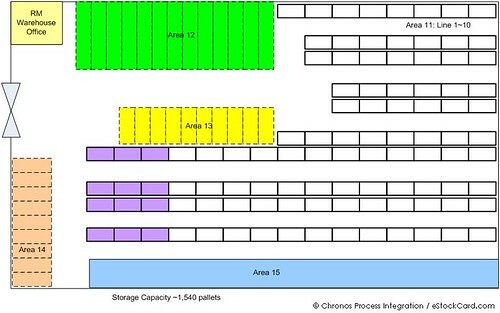 Inefficient storage can cause you to add warehouse space you don’t need and to limit orders that you think you can’t store. You may have enough space; you just may not be using it well. Decide if ideas like racking, mezzanines and conveyor belt systems can help you use space better. Make sure you have established critical inventory levels for each product. This is the level below which you may not be able to meet demand. Set an acceptable inventory level by averaging how much of the product you carry per month and adding a percentage for safety stock. One of your strategies for assessing warehouse operations should be to evaluate how inventory levels are maintained. As much as 70 percent of a stock picker’s time is spent walking through the warehouse. Evaluate whether you need to locate important inventory (fast-moving stock) near the stock pickers so they can easily get to it. Assess your operation by how much time is spent looking for stock or walking to it. If you do not have bar code technology, evaluate how it can help you track items in the warehouse. If you do have bar code technology, look at how well your employees are using it. Bar codes can help you track products, speed up the retrieval process and eliminate paperwork. Based on sales forecasts, look at how much additional product you could store if you had to. Evaluate the warehouse operation in terms of its ability to be flexible, and provide space for new products or new product sizes. If you have one product stored in several locations, assess whether that is the most efficient way to store it. Also, evaluate whether employees know where to find multiple locations for a product. You may want to consolidate locations so that products are not too spread out, causing unnecessary reordering and delays in filling orders. The way vendor package products can affect your warehouse operational costs. If you want ship alones — items reshipped to customers in original packaging — and your vendor has repacked these items in non original packages, you will incur a great expense in preparing them for shipment. Also, if your storage procedures require pallets with specific heights, make sure your vendors are in compliance. You may be spending money correcting vendor errors and inconsistencies. The eStockCard Team is glad to announce that we will be giving 30-day Satisfaction Guarantee to the new customers who purchased Chronos eStockCard Inventory Software from 30th August 2012 onwards. For any reason you are not satisfied with our software, please email and tell us your concern, we will try our best to solve it within 10 days. If after this period of time we still unable to give you a solution, we will honor the 30 days money back to you. Any administration charges being charged upon by the credit card company, payment gateway or banks would be deducted from the refund amount. If you have any question on this, please feel free to contact us. Thank you. Spare parts inventory management plays an important role in maintaining the stock inventory at an optimum cost. Presently, the industries are going for capital intensive, mass production oriented and sophisticated technology. The downtime for such plant and machinery is thus extensively expensive. It has been observed in many industries that the non-availability of spare parts contributes to as much as 50% of the total down time. Further to that, the cost of spare parts is usually about 50% of the total maintenance cost for the factory. Thus, it is a paradox to note that the maintenance department is complaining of the non-availability of the spare parts for their usage and finance department is facing the problem of increasing locked up capital in spare parts inventory. 1) There is an element of uncertainty as to when a part is required and also the quantity of its requirement. This is due to the fact that the failure of a component, can not be estimated correctly. 2) Spare parts are not that easily available in the market as they are not fast moving items. Only the original manufacturer has the supply of spares. Ususally new models are introduced to incorporate the design improvements and old models are phased out thus the spares for old models are not readily available. 3) the number and variety of spare parts are too large making the close control more and more tedious. For instance, the number of items of spares in a medium scale engineering industry may be around 30,000 and that in a large scale chemical industry may be around 150,000. 4) There is a tendency from the stage of purchase of the equipment to the stage of the use of the spare parts, to requisition spare parts more number than that are actually required and accumulation of spares takes place. 5) The rate of consumption of spare parts for some are very high and for some are very low.